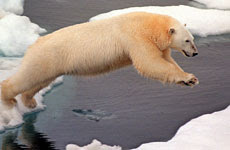 The United States has blocked the release of a landmark assessment of oil and gas activity in the Arctic as it prepares to sell off exploration licences for the frozen Chukchi Sea off Alaska, one of the last remaining intact habitats of the polar bear. Scientists at the release of the censored report in Norway said there was "huge frustration" that the US had derailed a science-based effort to manage the race for the vast energy reserves of the Arctic. This month, the Bush Administration drew widespread criticism when it said it would auction off 30 million acres of the remote Chukchi Sea that separates Alaska from Russia on February 6. The sale to oil and gas companies has been rushed through before Congress can complete efforts to protect the polar bear under the Endangered Species Act, a move which could complicate efforts to auction off its habitat to oil majors. A draft of the censored recommendations called on governments to conduct proper research on environmental impacts before signing off new oil and gas projects in ecologically sensitive areas such as the Chukchi. America blocks environmental reports to push through drilling for oil in our last pristine Arctic environments, at a time when the very pollution from that oil is melting those Arctic environments much faster than anyone has predicted, the banality of their lust for oil is akin to a heroin addict who commits crimes for their hit and catches the rest of the world watching them with a mix of pity and disgust, land of the brave, home of the free never sounded so hollow.